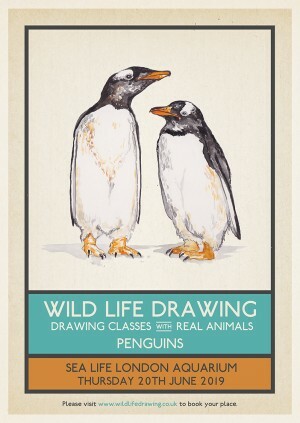 Delighted to announce not one, but two drawing classes with PENGUINS at the London Aquarium this summer. We will be starting early to sketch and learn about this delightful 'waddle' of Gentoo penguins (actual collective noun) before they start to wind down for their bedtime – as the conditions at the aquarium are set to mimic the light cycles, temperatures and air qualities of their natural habitat. These particular penguins are a mixture of male and female and range from 2 years old (Elton – the cheekiest!) to old girl Polly aged 23 years. Within the group there are a number of mating pairs and by the time June comes around, there may be a few eggs in those nests! Join us for this very special opportunity to sketch and observe these characterful birds and to raise money for the Sea Life Trust! The class will start with an introduction to penguins and their habitats, and we will discuss the issues affecting their conservation in the wild, namely climate change and habitat loss. We will be a smaller class than normal to ensure everyone gets a good view of the penguins, and once they start to settle down for the night attendees will be able to head off to explore the rest of the level with their drawing boards. We'll be on the higher level to usual and be able to view the Sea Turtles in their favourite spots, as well as the rays and the Sand Tiger sharks that patrol the tops of the tanks. We'll also keep the Jellyfish area open too, so there will be plenty to draw! The aquarium works closely with it's partner charity, the SEA LIFE Trust, to protect marine wildlife and habitats across the world and to communicate key conservation message to it's visitors. It is also involved in several breeding programs including the Cuban crocodile, seahorses, butterfly goodeids, and jellyfish, and works with many conservation organizations including Whale and Dolphin Conservation Society, Save Our Seas, and The Shark Trust. 50% of each ticket sold will be donated to the SEA LIFE Trust, making a whopping total donation of £250! The drawing class is open to all, from beginners to advanced. All drawing materials are supplied, including paper, but please feel free to bring colours or any other specific media you might like to use. Helpful drawing tips and guidance will be provided throughout the session by artist and workshop leader Jennie Webber. The aim of these drawing classes is to inspire a sense of appreciation and understanding for the animals and their conservation in the wider world.